May 27, 2015 By Tina M 20 Comments This post may contain affiliate links. Read my disclosure policy here. This was our first time trying out RoseArt washable chalk paint and I must say I’m very impressed. I dressed the girls in homemade paint smocks (kitchen garbage liners) because you never know when something says “washable” if it really is and I was in no mood to ruin clothes today. The good news is that it really is. When it dries it just looks like they have chalk on their skin! Easiest paint cleanup ever. You can use the paint cans, or the paint rollers. We used both and they seemed to use both of them equally. I loved not caring about all the drips and spills. It’s just chalk! Who knew a cardboard box could be so much fun?! That is so darn cute. I love how it came out. 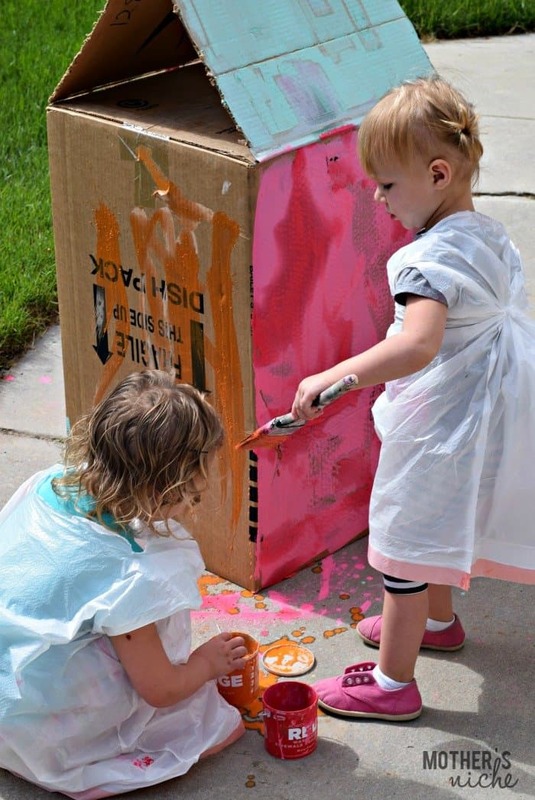 I never thought to let them paint a box like that outside!! What a fun craft for the kids to make! I think this paint is so awesome! I love the colors and the fact that it is washable. I have never tried this kind of paint before. It looks like something great for the kids! My girls would certainly have fun with it! This is really cool! I’ve never heard of this product before, but I know my son would have a blast with it. What a super fun creative idea! My children would love to participate in an activity like this and I would appreciate a mess that is easy to clean. These are SO cool! I love them for myself to play with! I am going to grab some for summer fun! What a cute idea. How have I never seen that paint below? It sounds perfect for our crazy, messy family. Thanks for sharing. What a fun little project for the kids. I have to check out that chalk paint! This is so neat! I didn’t realize there was chalkboard paint! Looks like they had a lot of fun! I may have to do this with my kids! Awww, what a cute idea! This looks like fun! Wow, I’ve never seen this type of paint before! This would be perfect for summer activities! Oh wow. I have never seen that kind of paint before. My kids would have the best time playing with it. Those little chalk containers are so cute! My son has a giant box in our backyard right now that needs some decorating! Oh yes! All that rain. sigh…but it looks like you guys had a lot of fun. So cute! Looks like a great product. I so could see my kids loving this craft or using it on the sidewalk. Those are neat little paint rollers. I like the cardboard house idea. My kids would enjoy that.